Put a large stockpot of water on to boil for pasta. Continue with next steps while you are waiting. Rinse dried mushrooms to remove any grit, and place in a microwave-safe bowl. Add water Add water (see note) and microwave for 2 or 3 minutes until boiling. Stir, and let stand 10 minutes. Continue with next steps. Heat a little olive oil in a nonstick skillet over med-high. Add ground pork, sausage seasoning, salt & pepper, breaking up with a spoon as you cook. When the pork is no longer pink, add fresh cremini mushrooms and onions. Saute 5-7 minutes, stirring occasionally. After soaking for 10 minutes, remove procini mushrooms from hot water, reserving liquid. Roughly chop porcini mushrooms, and add to the skillet with other ingredients. Add mushroom liquid to the skillet (if you see any grit in the liquid, you can pour through a fine mesh strainer lined with a paper towel). Stir in herb mix and simmer until liquid has reduced and slightly thickened. When water for pasta is boiling, add a generous amount of salt to season the water. Add pasta and cook 3-5 minutes, or until al dente (gluten free pasta will take longer). 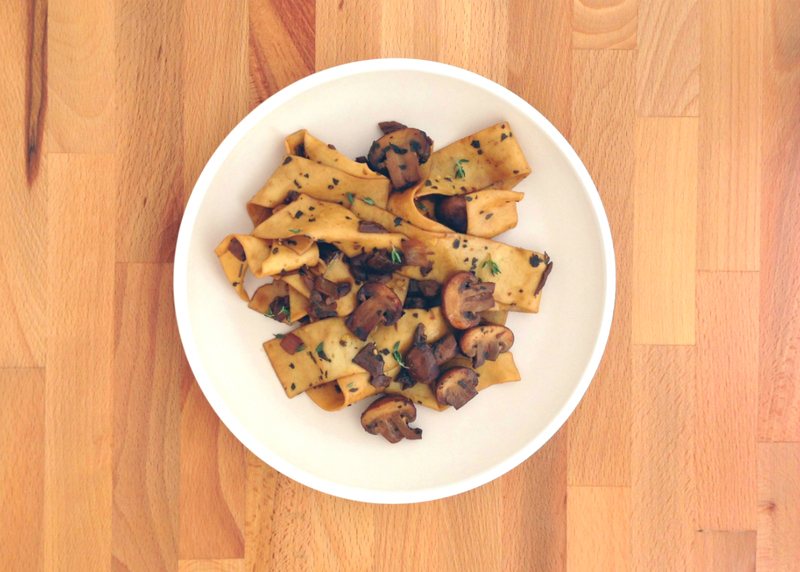 Strain pasta, and add to the skillet with mushroom ragout, tossing to combine. If it looks a little dry, add a drizzle of olive oil or a pat of butter. Pour vinaigrette base into the bottom of your salad bowl and add an equal amount of olive oil. Whisk or mix with a fork to combine. If this looks like too much dressing, you can remove some at this point before adding the greens. Toss gently and season with salt and pepper to taste. Notes: When recipe calls for water use: 2 cups for 2 portions, 3 cups for 4 portions, and 4 cups for 6 portions. This entry was posted in Meal-Kit Recipes, Meat, Pork on February 21, 2016 by Megan Rappe.